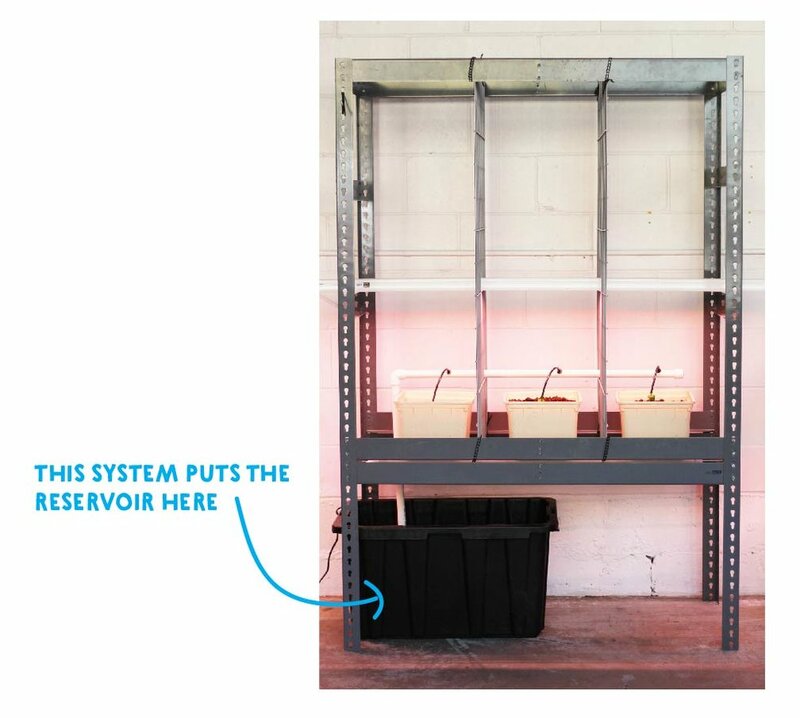 Plant starts are much easier to grow for crops that will be put into the NFT and DWC systems. Vining crops such as tomatoes and peppers can be difficult to start at home. 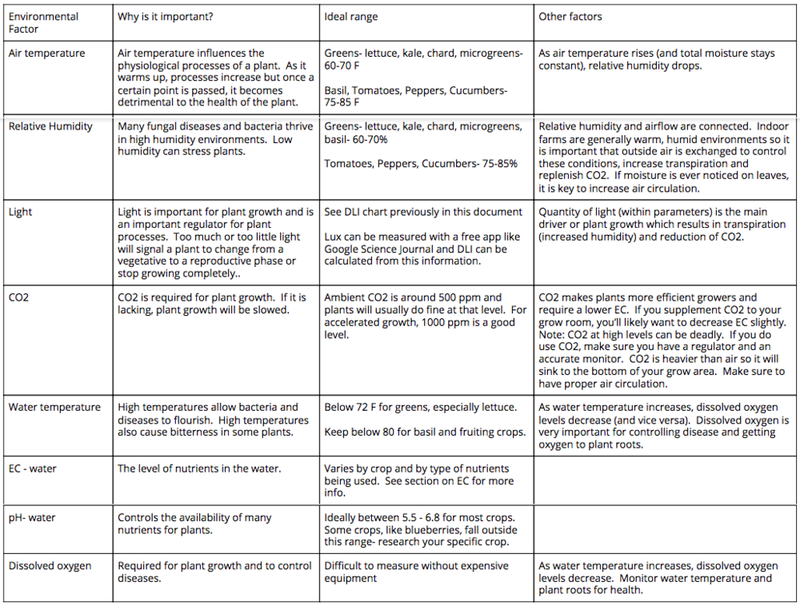 You may wish to purchase well developed plants at a local nursery. Bring these plants home and water well to make sure they are not stressed. When ready to transplant, remove plants from pots and lightly remove as much soil as possible, without damaging roots. If a little bit of soil remains, it should not be a problem. Once soil is removed, transplant into clay pebbles. After transplanting, allow plants to adjust to their new environment without lights for at least a day. Make sure to keep pumps running 24/7 to keep roots moist. Fill your reservoir with cold water and then turn on your system pump. Allow water to circulate through the system. Allow the system to run with water for at least 30 minutes and make sure everything is functioning correctly. If you are running a bucket system, begin by irrigating your crops for 10 minutes 3 times per day (10 minutes every 8 hours). As your plants get older and need more nutrition, especially with crops like tomatoes, you will likely need to increase the number of short feedings per day. The goal of the air stone is to increase oxygen levels in your water. The air stone should be located in your reservoir and working continuously. This will allow water circulated by the pump to have a higher level of oxygen. Note: some air stones can be adjusted. If this is the case with yours, start cultivation with a medium level of aeration and adjust up or down as you see how plants respond. 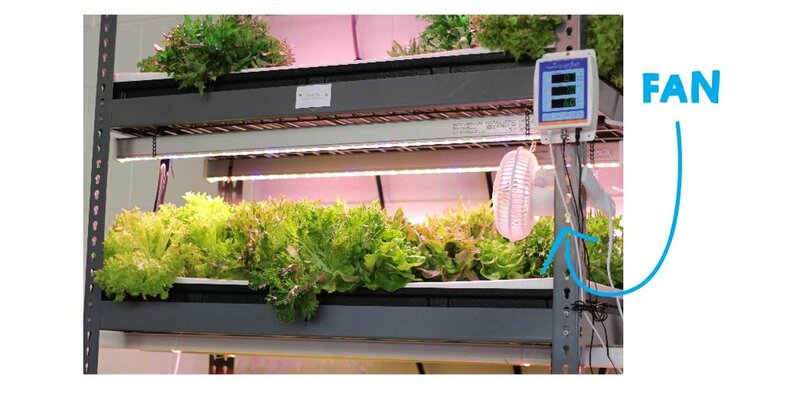 For vining crops we recommend high pressure sodium lights (HPS). It’s very important that the lights are kept the correct distance from the plants. Too far away and the plants will be starved for light. In response, they will reach towards the light and elongate, making the plants spindly, weak, and unhealthy. Too close and they will be burnt by the heat the lights give off. 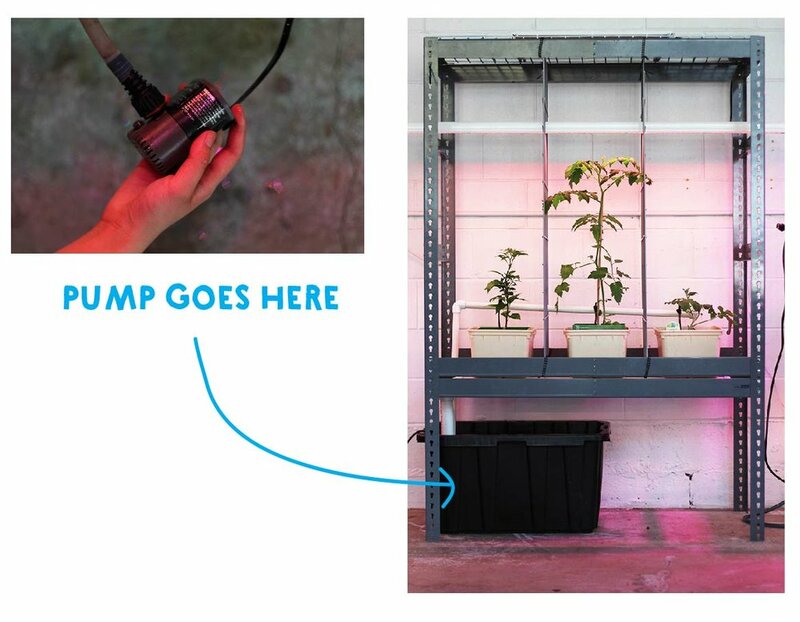 Some growers attach pulleys to their lights so they can keep them the optimum distance from their plants and raise them as the plants grow. It is also important to understand where your light is going. Is it reaching all of your plants evenly? We recommend starting with your lights 4” (four inches) above your plant canopy (tops of leaves). Make sure light is reaching all plants but leaves are not getting burnt. Adjust lighting as needed. After several months, your plants will be fruiting and ready for harvest! When you have completely harvested your system and it’s empty, it’s a good time to clean your system. We recommend you do system maintenance every two weeks when you begin using your +Farm. As you work with your +Farm and gain more experience, you may decide to do system maintenance more or less often based on what you observe in your farm. Eventually you should be cleaning your system about once a month. To clean the system, the main task is scrubbing with a scouring pad to remove algae and other debris. Add warm water (and a small amount of dish soap if desired) to make cleaning easier. Make sure to take the pump apart and rinse out all gunk in pump and clean the filter (this is easiest to do in a sink with a spray nozzle). Rinse buckets well after scrubbing to remove all debris. If you have seen any signs of disease in your system, you should follow your cleaning with a hydrogen peroxide flush. The point of a flush with hydrogen peroxide is to inhibit disease that may be in the irrigation lines or the pump. Take a plastic 5 gallon bucket and fill half way with water. Add one bottle of 3% hydrogen peroxide (available at most grocery or convenience stores). With a sponge, wipe all surfaces with the liquid. Then, disconnect and remove pump from reservoir and place in bucket to soak for at least 5 minutes. With pump oriented sideways or upside down, turn pump on and allow peroxide flush to circulate in bucket. Finally, dump flush into reservoir and reconnect pump. Turn pump on briefly to flush irrigation lines as needed with hydrogen peroxide solution. Once cleaning is done, dispose of this water in a floor drain, sink, or toilet. Finally, refill the reservoir with water, add nutrients, balance pH, add plants, and turn on the pump and lights again. Always monitor your system after cleaning to make sure everything is working properly, there are no leaks and there is sufficient water. Note: Hydrogen peroxide is not toxic to plants and can be beneficial by raising the oxygen levels in liquid. 3% hydrogen peroxide may have other chemicals to stabilize it and that is why we recommend disposing of the peroxide mix after running it through your system.